California Closets is proud to partner with architects, builders, and interior designers on custom closets and home organization systems. Our design teams and installers regularly work with developments and residential complexes to provide exclusive models and incentives for their residents. Over the years we have become a trusted partner on thousands of projects all over North America, creating inspirational custom storage systems alongside some of the best home professionals in the world. We work with custom home builders, residential developers, and architects, as well as realtors and interior designers, to provide customers with top-quality premium home features and customization to suit their needs and design styles. Our consultants specialize in designing systems for any type of room or building to meet a project’s needs and budget criteria. They use our proprietary CAD software and rendering tools to present their designs digitally. We are happy to support client meetings and sales presentations with a complete sample kit of all of our finishes and product options. 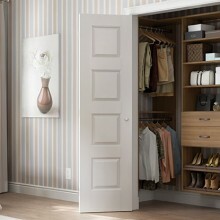 We can also outfit a model unit with a California Closets system so customers can experience our designs in person. 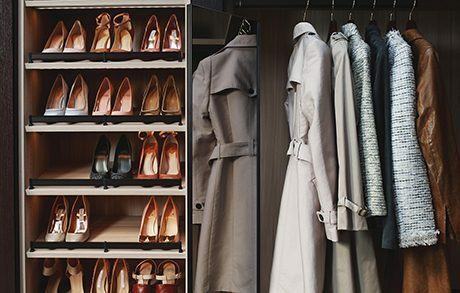 Our white glove installation service is executed by trained California Closets installers, never contracted out, to provide seamless, exceptional service. Our expert custom manufacturers use state-of-the-art software and equipment to meet any criteria for exceptional quality and service. We offer preferred pricing to qualified trade partners—please contact your local California Closets sales team for details. We have the best selection of products, finishes, and design accents in the industry. Our products are made from sustainable materials, are LEED certified, and represent the best quality.